By the time a Palestinian terrorist spends 20 years in prison, he or she will have been paid by the Palestinian Authority a cumulative sum of approximately 1,118,400 shekels. Upon release, PA law allows terrorists jailed for more than 20 years to purchase a car free of tax. In Israel, a Ferrari 458 Spider costs 1,000,000 shekels before tax. 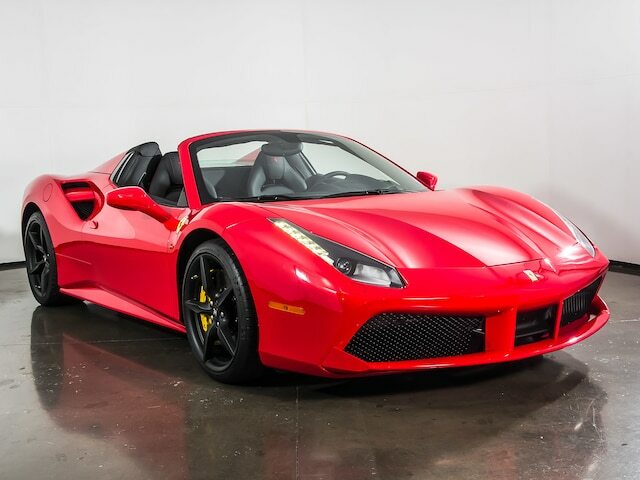 Accordingly, when released from prison a Palestinian terrorist has accrued enough "blood money", among other things, to buy a Ferrari. A monthly salary that starts at 1,400 shekels/month and rises to 12,000 shekels according to the amount of time the terrorist stays in prison. The monthly salary payments are based on the cumulative periods a terrorist spends in prison. 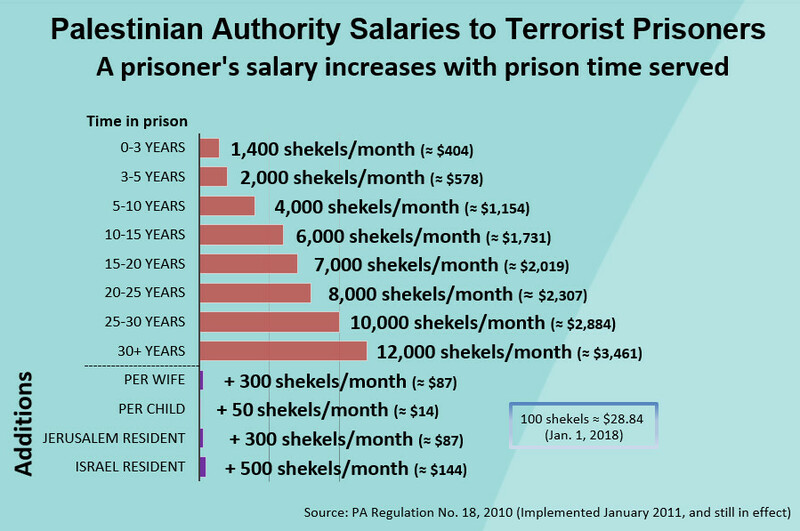 Accordingly, if a prisoner spent 3 years in prison, was released, and then was imprisoned again for additional terrorist acts, his salary during the second period of incarceration starts at 2,000 shekels/month (see chart above). Terrorist prisoners who were employed by the PA at the time of their arrest are entitled to continue to receive their original PA salary and will continue to enjoy the rises in the PA pay scales so long as their salary outside prison was higher than the regular terrorist salary pay scale. If their "civilian" salary was lower, they are entitled to the higher terrorist salary. In addition, terrorist prisoners are entitled to have university degrees funded by the PA. The children of terrorist prisoners are exempt from paying elementary and high school fees in PA schools. The children of male terrorist prisoners who were sentenced to 20 years imprisonment and have spent at least five years in prison and children of female terrorist prisoners who were sentenced to at least 10 years in prison and have spent at least 3 years in prison are entitled to an 80% reduction in university fees. An immediate one-time grant ranging from $1,500 to $25,000 depending on the time spent in prison. Terrorist prisoners who spent between 1 to 5 years in prison are entitled to "unemployment benefits" for a period comparable to the time spent in prison. Released male terrorist prisoners who spent 5 to 10 years in prison and released female terrorist prisoners who spent 2 to 5 years in prison are entitled to preferential consideration for employment by the PA, but even in the absence of any position being available, they are entitled to a monthly salary. Released male terrorist prisoners who spent 10 years or more in prison and released female terrorist prisoners who spent 5 years or more in prison are entitled to a monthly salary based on the pay scale of PA public servants. They are only required to fill a position if specifically called on to do so. Released male terrorist prisoners who spent 5 years in prison and released female terrorist prisoners who spent 3 years in prison are entitled to free university studies (unless they used this benefit while in prison); an exemption from health tax; and an exemption from professional training course fees. Released male terrorist prisoners who spent 5 years in prison and released female terrorist prisoners who spent 3 years in prison are entitled to have the university fees of one of their children covered by the PA.
A one-time grant of 6,000 shekels. A monthly allowance with additions for those who were married or had children or were residents of Jerusalem or other parts of Israel. Financial aid to 350 families. 700 grants for academic studies. 500 grants for trips to Mecca. School fees for 40,300 children. 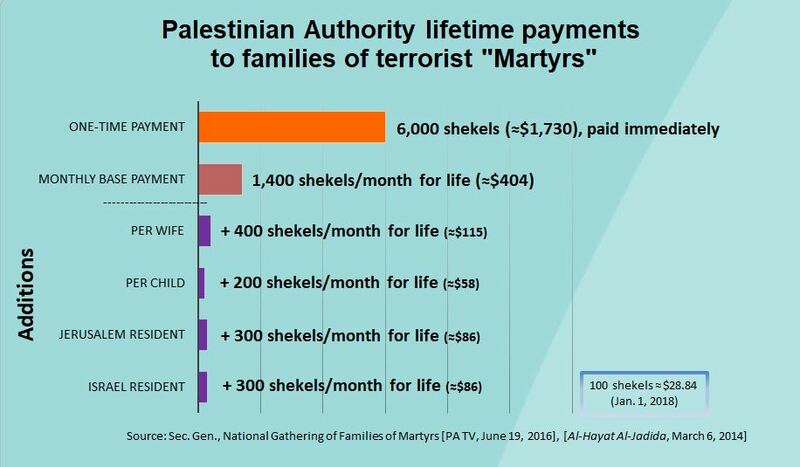 In July this year, Israel's parliament passed new legislation to combat the PA practice of paying monthly salaries to terrorist prisoners and a monthly allowance to the families of deceased terrorists - the so-called "Martyrs." Similar to the American Taylor Force Act, which passed in March and calls to cut almost all funding to the PA if it continues paying salaries to terrorists, the Israeli law declares that the payment of salaries to terrorist prisoners and allowances to the families of deceased terrorists is a "financial incentive to terrorism." For the financial year of 2018, the PA allocated 1.2 billion shekels (7% of its entire budget) to pay these financial incentives to terrorism. The new law requires Israel's Minister of Defense to prepare an annual report detailing the total annual expenditure of the PA on the terrorist salaries and other terror related payments. Once the report is approved by the Ministerial Committee for National Security, the Israeli Government will deduct a sum equivalent to the annual PA expenditure from the tax revenues Israel collects and transfers to the PA.
As noted above, the full extent of the PA's financial incentives to terrorism extend far beyond the payment of the salaries to the terrorist prisoners and released prisoners and the allowances to the families of deceased terrorists. Accordingly, in order to assist the Israeli government to make accurate calculations, Palestinian Media Watch prepared and sent to the relevant authorities a comprehensive document detailing the different payments to which the terrorists and their families are entitled according to PA law and practice. Whether terrorists want to buy Ferraris or not, the comprehensive nature of the financial benefits paid by the PA to terrorist prisoners, released terrorists, and the families of terrorist "Martyrs" clearly provides the basis for arguing that these payments are a financial incentive to terrorism. In many cases, the salaries and financial benefits paid to the terrorists exceed the salaries and other benefits paid to regular PA employees. Click to read the document sent by PMW to the Israeli government.